We’ve used thousands of Panavise phone mounts. 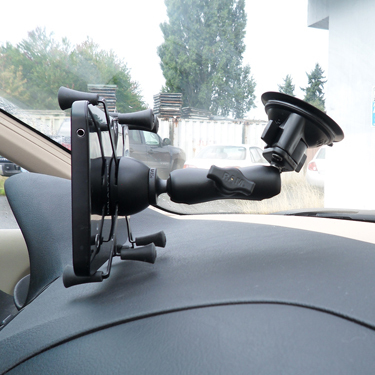 RAM Mount with a suction cup to the windshield so you have flexibility to mount left or right of your steering wheel. If I end-up using the Mob Armor and i put that little adhesive disk on the dash board, how do you get it off? I heard someone say fishing line and 'cut' it away. Is that the best/only way and will it leave a bunch of glue or residue on the dash? I bought an iPow mount that’s supposed to go in the CD slot but it kept vibrating out so I moved it the the side of the dash next to the steering wheel. I just bought that $20 Scosche dash Magic Mount and it's great. Mounted it in the space between the vent and 4wd knob. Put both magnets in the back of my iPhone case and it works better than I thought. Trying to decide which route to go. Which Mob Armor cradle mount fits iPhone X, small or large (I didn't see the X listed on the capability list)? Kinda wish they had a wireless charging version. Has anyone had issues with the Scosche mount (specifically the plate you put on the phone/case) messing with wireless charging? Has anyone tried the Scosche wireless charging version of their magic mount? Both versions adhere to the dash with adhesive, correct? And yes, the Scosche plates mess up wireless charging. Can you post a pic of your set up, how/where you have it mounted? Nite-eyez ball and magnet mount. I use a magnetic mount. It's made by Schosche, but there are other similar ones available that will probably work as good. It is really easy to just throw it on there and it sticks, and to pull it off does not take any effort, although it sticks strong enough to not fall off by itself going through a dip or bumping it with my hand for whatever reason. It also has a little hook in the back so my charger cable sits there convenient to plug in. Think I'm sold on this for my phone. Thanks! Still wondering if I should look into something minimalist to mount an iPad on passenger side. Scosche might work well theresince I wouldn't be concerned with wireless charging. Maybe? I use a maxboost from Amazon. Uses magnets and attaches with 3M tape to the dash and a thin metal plate attaches to the back of the phone. Seems pretty stable so far. A lot of mentions in the Amazon reviews for the Mob Armor about the base being plastic and breaking where the magnets attach. Has anyone here had this problem? Y'all have a link for the coiled charging cable? color matched wrap. big pimpin. i dig that! This - all day long. I have them everywhere. Toolbox, bicycle, shower. Best ever. Sticks real good. I got mine at the Verizon Wireless store when I got my phone. I just looked at the online store and they have it there, but the reviews are horrible - 1 out of 5 stars for about 186 reviews! so I would rather not post that link. Mine has been working great for more than a year now - so I am not sure if the link is to the same product; description looks the same. Maybe they changed suppliers or something. We get them for our work phones and tablets for the field crews so we have probably about 60 of them in the field trucks, and I have not heard any complaints; we would not keep buying them if we have issues with them. So, I think it works awesome, but based on the reviews I am not going to recommend it here. ??? Sunnier and dmiller like this. Pro clip with a Ram attachment. I like it since I use the phone for navigation and it puts it at an easy viewing level. Watt maker and CaptSpaulding like this. Anyone used the Scosche to hold an iPad? Will not hold? Not for off-road purposes, but passenger viewing on road trips. It will hold an ipad - the magnet is strong enough, but you will have to place the magnet plate higher up on the back of the tablet. What I see with my phone is that I have the plate lower because of a finger print sensor in the middle of the back of the phone, so it is top heavy and tend to twist around. I have to keep the phone plugged in so that the cable hanging out the bottom act as a counter balance to keep the phone right-side-up. There might be better beefier solutions for an ipad; it works great for the phone though. Those magnets are pretty strong. Depends on the case probably. Too thick and it won’t hold. There was a build on here where a guy had a cell mount the was metal and screwed to the chrome vent circle. NE1 on here know who this person or mount is? Exactly what I have, in the exact location. I love it. I have this and I absolutely love it.